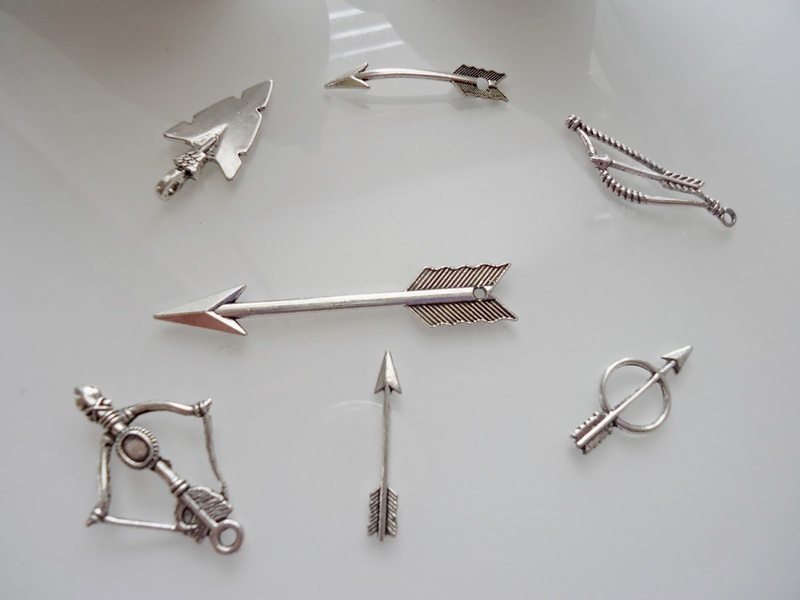 Recently I’ve been into all things containing arrows, be it arrow necklace charms, arrow printed scarves, stationary and I even caught myself doodling arrows in my note pad. I thought to myself perhaps my subconscious was trying to tell me something as it subtly loves to do. I’m a highly driven person with a million and one ideas fleeting throughout my mind. It can be hard at times when trying to find direction for those thoughts and ideas and ground them to fruition. Alas, I came across Artemis as I like to find the “deeper” or rather, esoteric meaning to my surroundings and more specifically symbols that are a part of my everyday life. 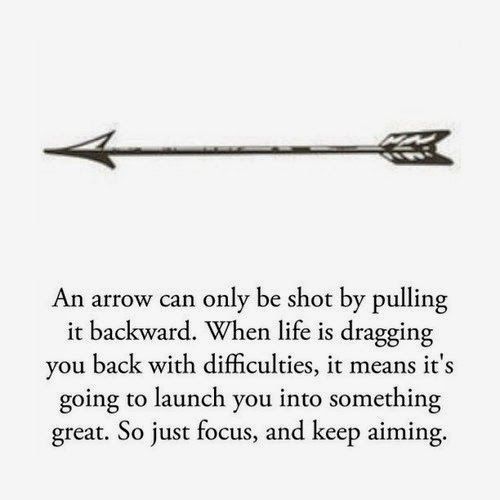 At least to me everything has meaning and arrows have always served as a symbol for direction. It is a universally understood symbol for “go that way” or “this way. Artemis’s main tool is known as the bow and arrow. It represents control of the hunt, eye on the prize. Eventually arrows became a symbol of war associated with Mars and thus released from its original matriarchal roots. 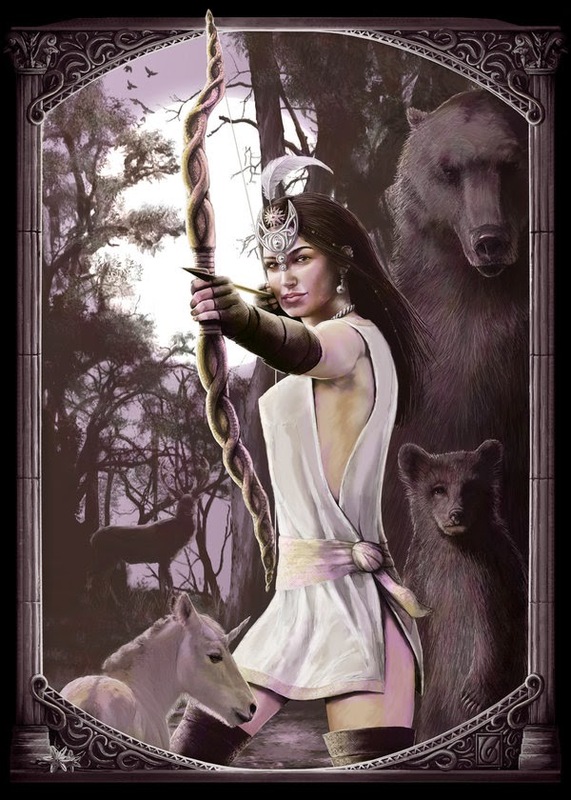 Nonetheless, the energy of Artemis can be utilized to enhance drive, ambition and focus to your endeavors. 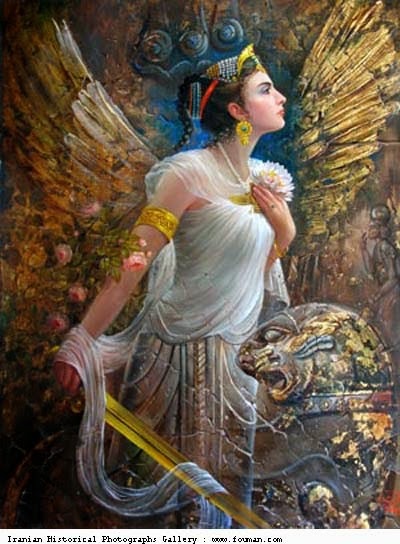 Every painting or picture I see of Artemis, I see a focused woman with her intent fully scoped and ready for the kill per se. Focusing on your target and accomplishing what you set out for. In honor of this productive yet beautiful goddess, I bought a set of arrow charms on Etsy and will be adding them to some directional and goal charms for late summer early fall this year. In the mean time I will continue to work on energizing my goals with this deity’s ambition driven energy. During Mother’s Day Lancome had a free gift sale with a purchase. I’ve heard some great things about Lancome’s concealers so I decided to purchase a concealer (of course being the self professed concealer junkie) and a blush. I got the deepest color in the display “Plum Noir” and I absolutely love this color. I’ve been on the hunt for a deep purple blush for some time and they always seem to come off as dark pink on me as opposed to the purple plum tone I’m looking for. But nonetheless the color pay off on Plum Noir is beautiful. Now off to the concealer. It’s been about a month since I’ve purchased this concealer and love the semi sheer consistency. The color is right on for my skin tone right now and it blends easily with my beauty blender. I prefer to use a concealer brush with this however because the blender soaks it up too much. This is a bit too sheer for what I’m looking for so I’m going to check out the water proof version in a tube as when I swatched it, it seemed to be the coverage I’m looking for. Now on with the freebies! Along with my purchase of the concealer and blush I got this super cute make up bag with a few sample items. First was the cute pink bag of course and the make up remover and corrector. I gave the corrector and make up remover away as I don’t use these but kept the below. 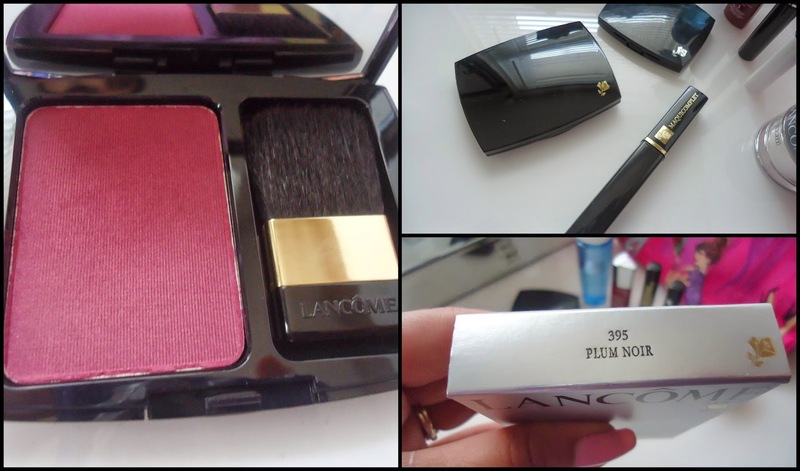 I was surprised to see how many beautiful and highly pigmented eye shadows Lancome carried. 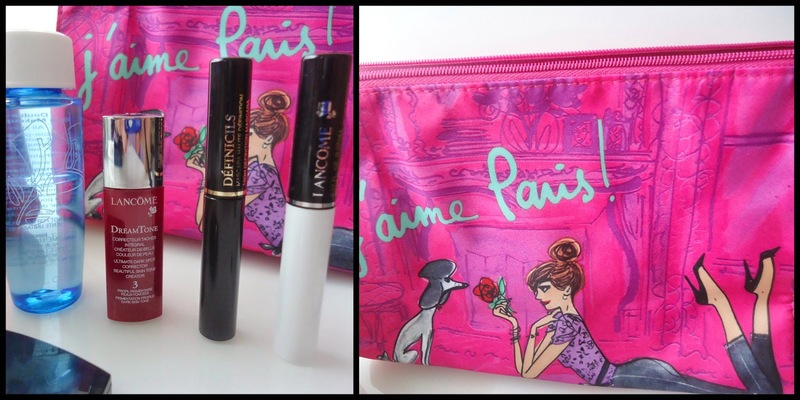 I have recently been a MAC snob when it comes to shadows but loved the variety Lancome had. 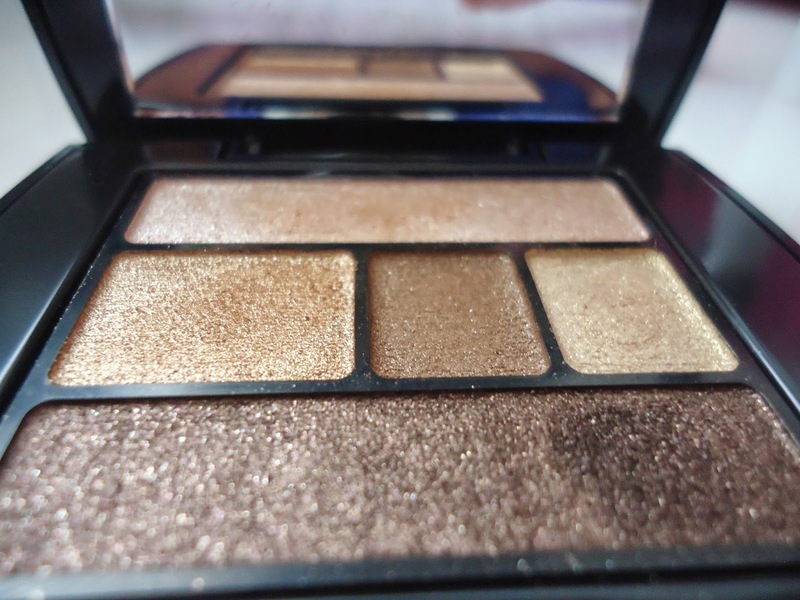 I loved this brown and gold palette that came with the gift, color pay off is great and the feel is smooth. Only issue I noticed were that most were a bit shimmery and they tend to flake a lot. 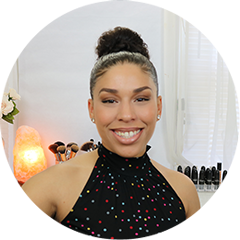 I don’t like eye shadow fall out as I always do my eyes last and requires a lot of clean up. In the gift I also got this night cream which I really like. It’s lightly scented and my skin actually felt like it soaked this in as opposed to just siting on my skin. 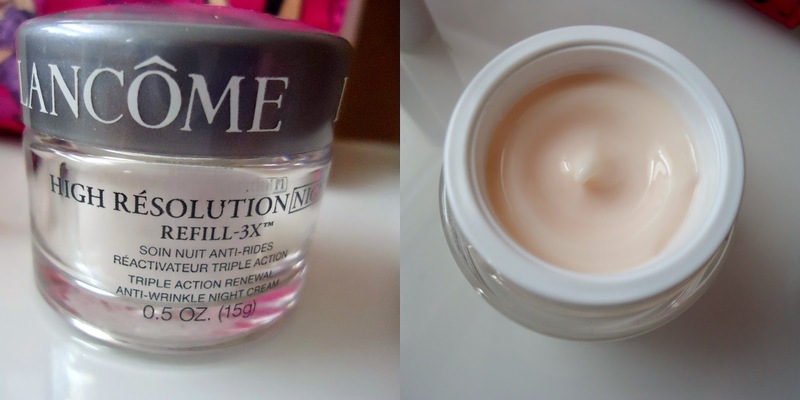 This lasted me about 3 weeks using it nightly and liked the way my skin felt in the morning. I still have my aveeno so once I run out I may actually buy the full bottle of this. I’m not a big junkie when it comes to mascaras as my lashes are naturally long and as long as it does not smudge they all seem to work. 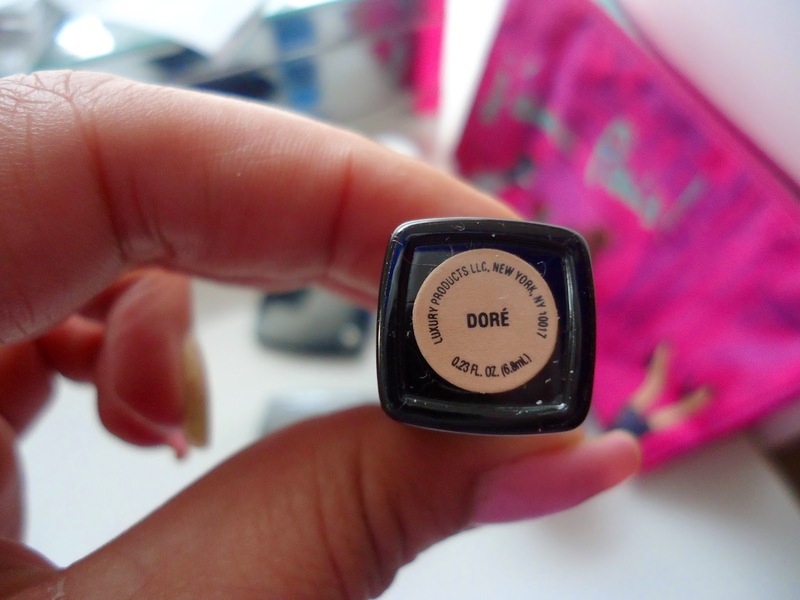 This however is a holy grail for me and will for sure get this on my next splurge. I was skeptical when I seen it came with a primer but gave it a shot as I’ve never used a primer for mascara. Holy cow! This stuff is amazing and my lashes just bloom with these. 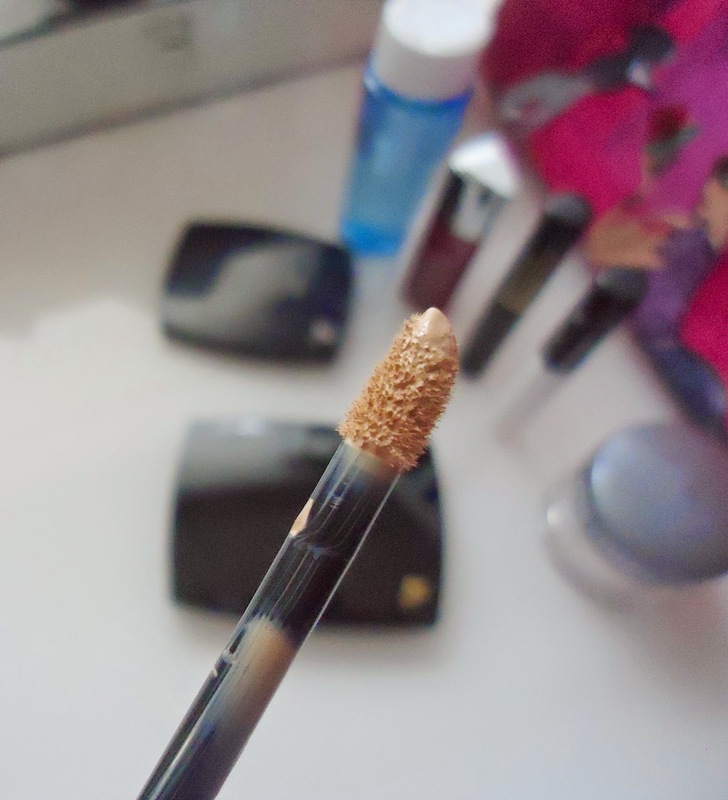 I really love this Lancome Cils Booster eye lash base/primer. 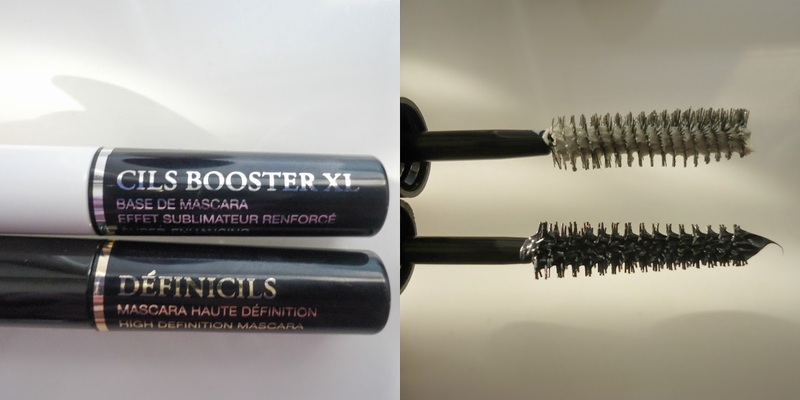 It really sets a great boost to the actual Lancome Definicils Mascara in black. I’m glad I was given a sample of this. Once I get the full versions (budget permits) I will share the before and after.